I am using a straight html page with nothing else on it for testing so I could see if I could use two menus on one page without a conflict. The only one that shows up on the page is the last one I link. You can see both of them in the code but in this case only the horizontal shows up. Can you tell me how to fix this please. My page is behind a firewall so you can't see it but here is the code that was generated by linking the menus. Please, check the positioning of your menus. In case you have positioned your menus relative to an element, that element should exist in your page, so that the menu can be displayed. I figured it out from your mention of the element. Thank you. Please don’t spend more time on this. November 3rd, 2014LWSC: Can I have the scroller scripts in different folder than the HTML pages? Knowledge Base support case for Likno Web Scroller (jQuery Slider) Builder, abstracted and stripped of all user’s private info. I hope you can answer the following. I like keeping the html pages on a separate folder and the scroller components on a different folder (not everything together). I just published a web scroller and I copied and pasted the generated code to the page in which I like the scroller to show and I modified the src to the location of the .js and I also modified the location of the pictures but still not working. I guess I need to make changes to the .js file? There should not be any problem with that. You could move the likno-scripts folder or your HTML pages and then change in the Linking Code the src to point to the project.js file. Could you send me a URL so I can check what is missing or your folder/files as a ZIP? Glad to see its working ? October 10th, 2014AWM: Can I create a clone of my menu that will not have any links? Initial Email Subject: Hi I have a strange question. Bet you have not heard this one before. Is it possible to have a page that uses your menu that does not link to anything. I then have another home page called index.html which is the main site. I use your side menu and would like to have this menu showing on default.html (showing all the pages that it links to) but without the links working. I.e. to tantalize the viewer but not allow them to go further into the web until they become a member / contact me. I.e. all other pages within my site with the menu will need to work normally. A strange request. I apologize. I hope you can accommodate me. Hmmm….i can think of 2 solutions. 1st solution: You can create a copy of the existing menu and then remove the links. This way you will have 2 menus which look identical but the one does not have links. The one with no links you can link it to your default.html page and leave the other one as it was. 2nd solution: You can have your menu as CSS menu, which means you need to add the UL/LI structure in your pages. You can have the regular UL/LI structure to all the pages instead of the default.html in which you can remove the <a> tags from the menu items. So, the links will not work. In this solution you will only have one menu linked to all pages, but you have to add the UL/LI structure to all your pages. This will be easy if you have an include file but if you not it will take you more time. Please, let me know if you need further help. Let me try the first solution. I think it will work best. When you say copy exactly how do I do that? I know there is the code you include in your page. I also know about the folder that contains menu code and images for menu parts etc. and a menu.js (I think) within the html pages. A copy would, I assume, duplicate the folder to another name, call it differently from the page and refer to a change from menu.js to menu1.js (I think) which would not have links. I have got quite lazy and simply add new pages into the menu.js file as new lines with the new page and link. I.e. I don't use your console any more as template is set up and runs. Apologies if I have totally missed your point on what to do. Also for the bother of this long email. Then, open it in AllWebMenus and remove the links from the items you don't want them to have links. Then, compile that project and link it to your default.html page. It should show as expected. Movie 'Annabelle: Creation' was released in August 3, 2017 in genre Thriller. David F. Sandberg was directed this movie and starring by Stephanie Sigman. 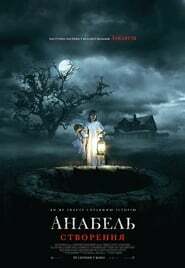 This movie tell story about Several years after the tragic death of their little girl, a dollmaker and his wife welcome a nun and several girls from a shuttered orphanage into their home, soon becoming the target of the dollmaker's possessed creation, Annabelle. New Line Cinema, Atomic Monster.